There are numerous ways to enjoy the majestic beauty of Veligandu’s lagoon, both beneath the surface as well as above it. Whether you are a seasoned water sports enthusiast or just a rookie looking for some extra fun above the waves, you’ve come to the right place! 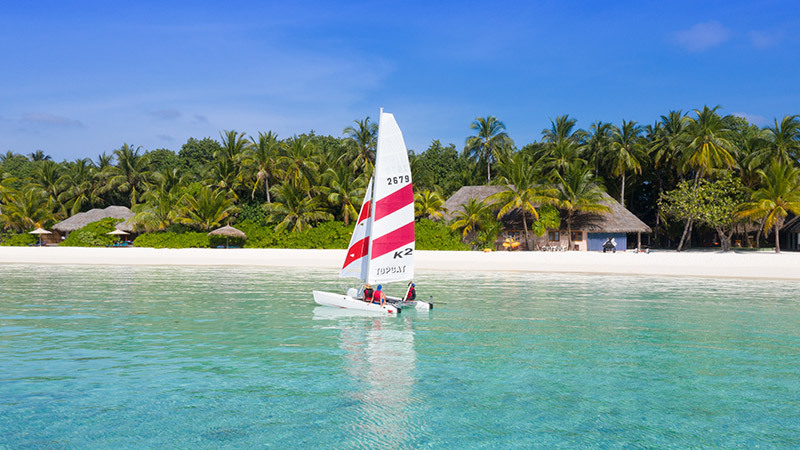 Veligandu is blessed with excellent conditions for water-based activities in the Maldives, with its crystal clear shallow waters, coupled with long and vast stretches of deep blue ocean waters and a refreshing breeze to cool you off in the heat. Unsure what to begin with or uncertain of your level of expertise? Worry not, our qualified Ocean Water Sports Team will thoughtfully recommend an option to suit both your experience level and preference. Equipment rental and lessons can be booked at the Ocean Water Sports Centre. Please be informed that due to health and safety reasons, guests are kindly advised not to use any water sports equipment without prior consent from the Ocean Water Sports Centre Team. Damage or loss of rented equipment will be charged to the guest at repair or replacement value. Go snorkelling or diving further out at sea with a personal Sea-Doo watercraft and explore the lagoon at your leisure. Crisscross Veligandu’s shimmering lagoon while bouncing off the waves on jet ski for guaranteed adrenaline-filled fun. Feel the energy of wind and waves as you cruise Veligandu’s sparkling lagoon, windsurfing to your heart's content. Feel the thrill of speed and water splashing against you, as you glide your way across the lagoon on a water ski. Feel the tropical breeze in your hair as you steer through the crystal-clear lagoon aboard an idyllic catamaran. Rent a kayak and roam the warm waters of North Ari Atoll in search of scenic views above and below the water. Grab your friends and experience the effortless thrill of riding a tube across the lagoon. Enjoy a splashy, adrenaline-filled adventure ride at sea atop a towable wakeboard. Leisurely paddle your way across the lagoon as you contemplate the vast ocean views beneath your feet.